1:44 -faltering-now, will we get a sell signal, and will we get a following? 10:27 A typical day has a 3, 4, 5, or 6 hour fractal. Midway there is congestion or a counter move. behaves, and how you behave. Both are chaotic systems - yes, you too can "go chaotic." I suggest all traders find their nearest instructor and take the basic course. 9:55 Every morning before trading, I like to test a set of beliefs to see if they are positive. The first one I check is "I deserve to be rich." The second is "I am worthy of being rich." not positive, no tools will make you trade well. my answer was "A clear mind"
4/4/2008 2:44:22 PM Mountain GD:: anyone stilll around? 4/4/2008 12:36:29 PM Mountain Ben:: Al, this is a slow mover. Are you going for a 9 pointer? The only way currently to overy the Tides on your own chart is to use something like Wave59, which can do it, and get the MoonTide sofeware to generate the data files. 4/4/2008 10:53:44 AM Mountain GD:: Thank you MM. Now I have a question about creating the Larson Bands. My charting software can do Bollinger bands but not the Larson bands. Can you help with that creation? In addition, is there a way to overlay the moon tides chart with one's own spx chart for precision or does everyone just eyeball it? 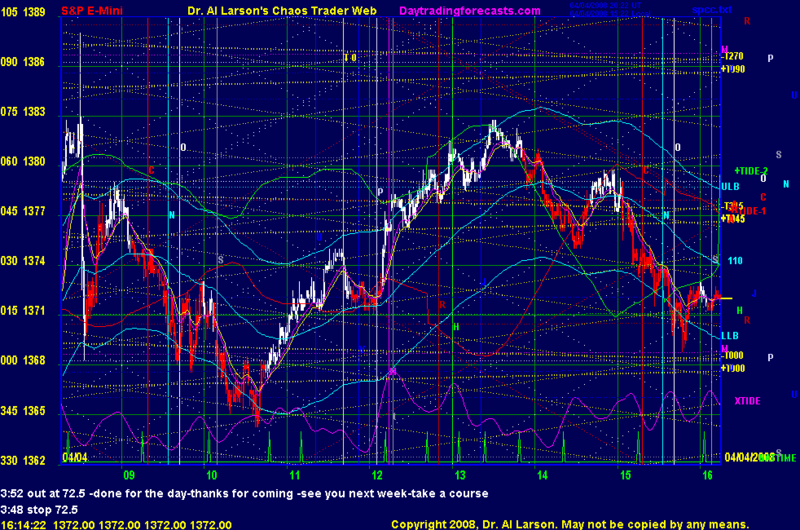 4/4/2008 10:23:23 AM Mountain GD:: Al, Just so I understand this correctly...you provide the moontides chart the nightly and we use that chart in conjunction with our own price charts to create and find trades correct? If so, aren't the moon tides prone to change during the trading day? How do we know about changes and updates? 4/4/2008 9:28:49 AM Mountain GD:: Very interested in trading with Al but have no idea where to start..